I have been having a deep love affair with vegetables lately which is pretty strange considering I was mentally preparing myself for being the typical pregnant lady and downing cupcakes by the dozen. I do my best to squeeze veggies in my smoothies, cooking them down and adding them to my enchiladas, and earlier this week I made an awesome Shepherd’s Pie. Instead of using sweet potatoes or regular potatoes as the topping, I steamed cauliflower and butternut squash together and made a puree. This is a super simple recipe you’ll want to add to your weekly dinner rotation. We’re jazzing up lean ground turkey and packing enough vegetables to keep the turkey moist and adding tons of flavor. 1) Start by separating the cauliflower from the head and steaming the florets stove top or in the microwave until fork tender. Add in the frozen butternut squash for the last 5-8 minutes or cook as directed on package instructions. Place the cauliflower & butternut squash in a food processor along with a tablespoon of butter and a splash of milk and process until a puree is formed. Add salt and pepper to taste and set aside. 2) Preheat oven to 400 degrees F. In a large pan, heat oil over medium heat. Add carrots and onions and cook until soft, about 5 minutes. 3) Add turkey and cook, breaking up meat with a spoon, until browned, about 6 minutes. 4) Stir in flour and cook 3 more minutes. Stir in peas and rosemary. 5) Season with salt and pepper. Pour in chicken broth and stir. Bring to a simmer and cook until slightly thickened, about 5 minutes. Season with more salt and pepper as desired. 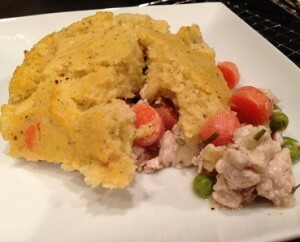 6) Transfer to an 8X8 baking dish and spread cauliflower/butternut squash puree across the top of the turkey mixture. Bake uncovered for 25 minutes or until golden brown on top. Coach Kozak loved this dish so much, he ate the entire dish in one night! After I had my portion of course. He even said he’d like to see me make this dish once a week because it was so flavorful and light. 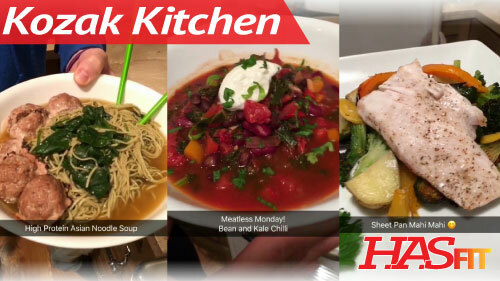 This is an awesomely easy, low carb, and high fiber dinner that’s great any day of the week!